A vacationing businessman was walking along a beach when he saw a young boy. Along the shore were many starfish that had been washed up by the tide and were sure to die before the tide returned. The boy walked slowly along the shore and occasionally reached down and tossed the beached starfish back into the ocean. The businessman, hoping to teach the boy a little lesson in common sense, walked up to the boy and said, “I have been watching what you are doing, son. You have a good heart, and I know you mean well, but do you realize how many beaches there are around here and how many starfish are dying on every beach every day. Surely such an industrious and kind hearted boy such as yourself could find something better to do with your time. 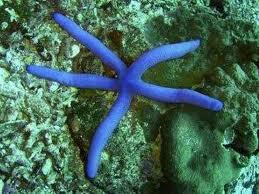 Brilliant stars of the heavens were placed into the sea when God created ocean creatures with their beauty. As we gaze into the waters His wondrous plans unfold the Star Fish sings his song of praise while spun in noble gold. The Creator made sea creatures and waters wherein they swim man and fish, on earth and in sea owe their very lives to Him.